We have a brand new trailer for Mary Magdalene. Biblical epics are nothing new. In fact, they're one of the longest-standing traditions in Hollywood. Specifically, the tale of Jesus has been told many times over, be it in Martin Scorsese's The Last Temptation of Christ, Mel Gibson's The Passion of the Christ or anything in between. This time around, it's the titular Mary in the spotlight as this movie looks to tell the familiar tale from a very different and unique perspective. The trailer is loaded down with gorgeous, epic visual, sweeping music and plenty of drama to go around. It's also quite evident that this won't be some sanitized version of the story, as it sets the stage for violence and various manner of brutality. It's a clear showcase for its two leads, Rooney Mara and Joaquin Phoenix, who play Mary and Jesus, respectively. Both of these stars are capable of turning in stunning performances when they're given something solid to work with, and it's clear they've got something meaty to work with here. Perhaps the most surprising thing after watching this trailer is that it's not coming out during awards season, but there's a reason for that which has nothing to do with the quality of the movie itself. This project was shot back in 2016 by Garth Davis, coming fresh off of his Academy Award nominated Lion. That, coupled with the two stars and a new take on an old, bankable tale, it seemed that this was poised to be a possibly big hit and Oscar contender. However, this was swept up as part of the Harvey Weinstein scandal, as The Weinstein Company had been involved in the production. As such, the finished product has been sitting on a shelf for some time after it lost its initial distributor. But IFC Films has stepped in to finally give this thing a release. 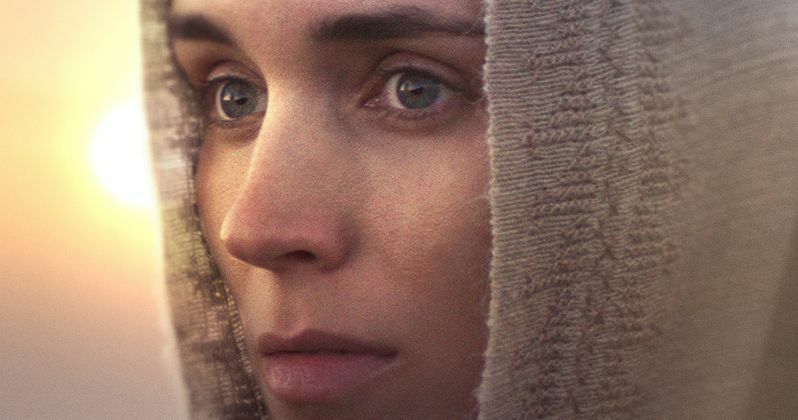 In Mary Magdalene, for the first time, this classic story is told through her eyes. In the first century A.D., the free-spirited Mary (Rooney Mara) flees her arranged marriage, finding refuge and a sense of purpose in a radical new movement led by a charismatic preacher by the name of Jesus (Joaquin Phoenix). The sole woman among his disciples, Mary defies the prejudices of society as she undergoes a major spiritual awakening and finds herself at the center of a dramatic moment in history. Helen Edmundson and Philippa Goslett penned the screenplay for the Biblical drama. The cast also includes Chiwetel Ejiofor Tahar Rahim, Denis Menochet and Ariane Labed. We've also included a new poster that the studio has unveiled ahead of the movie's release. Mary Magdalene is set to arrive in theaters on April 12 before hitting digital and on-demand platforms a week later on April 19. Be sure to check out the brand new trailer from the IFC Films YouTube channel below.